All of us have the same problem. 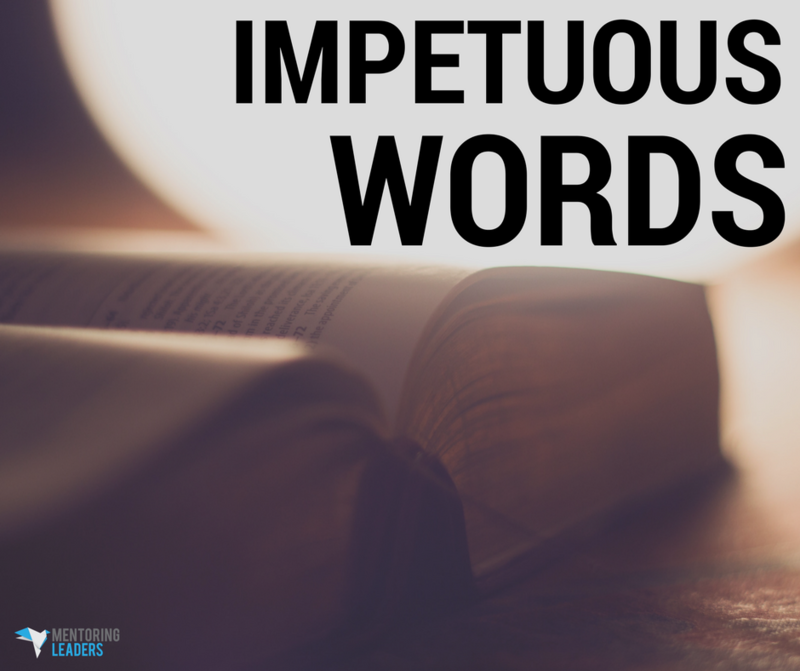 Impetuous words — words that are reckless, words that we speak first and think about later, only to have regret and remorse. In order to train our tongues so that we refrain from evil, we have to do some preparation in advance and practice certain things until they become part of our default system. Then, in times where something is demanded of us, when we are caught in an emotional centrifuge and we are wrestling with some things, we have to have some things already in our default so that our response is better. We must be able to practice certain things so that it becomes our default system so that in the moment of challenge, we are able to respond much more insightfully because we have prepared beforehand. Otherwise, we will be constantly making impetuous decisions. The training has to be done before the challenge arrives. So how do we do that? We do it by testing ourselves. To learn or develop a default that is godlier, we have to ask ourselves questions about godliness. We must test ourselves to see that we are in the faith. Here are three questions that I pose to myself often, especially when it comes to answering challenges so that you do not have impetuous answers. What Am I Filling My Mind with Every Day? What goes in, comes out. This is exactly what the Bible says. “… the mouth speaks out of that which fills the heart” (Matt. 12:34). Whatever we put in is going to come out, and that is why it is important to take the time every day to fill our hearts—even a little bit—with godly thoughts. That is done through our daily devotions. Think abut it. If we do not do daily devotions, we hardly give anything into our heart of godly thoughts. That is why when we are challenged, only fleshly thoughts come up. It does not matter how much we know about religion; when we are put against the wall, shoved against the wall, stuff that is inside of us is going to come out — our defaults. We must make sure we are putting things into our minds and hearts that will enable us to build what the Bible calls a treasure. We can have good treasure or we can have fleshly treasure that we are going to respond with. Whatever we feed the most is what we are going to use. “The good man out of the good treasure of his heart brings forth what is good; and the evil man out of the evil treasure brings forth what is evil; for his mouth speaks from that which fills his heart” (Luke 6:45). What are you filling your heart with every week? Make sure it is godly. Make sure you take the intentional time to fill your hearts with godly thoughts. Otherwise, when the challenge comes, you will speak out of that which fills your heart. Do I Have the Courage and Humility to Repent if I am Wrong in Spirit or Fact? Do I have the courage and humility? Before you speak, ask yourself, “Do I have the courage and humility to repent if I’m wrong?” If you say, “No way. I’m not going to repent. I’m not going to ask for forgiveness,” then don’t say anything. You must have the humility and courage to repent. If not, be very careful, because, remember, you will get yourself in trouble with impetuous words. You paint yourself into the corner, and then if you are too proud to repent, then you imprison yourself and your future by your words. Watch that anger on the inside. How do we deal with that, because we do get angry? Do we have enough courage to repent? That is what we have got to build, and that has to be built into our default system. Can I Think Before I Speak? Can I think before I speak? No! Then, don’t talk. Change that. Learn to run your words through that grid, otherwise, you’ll have impetuous words and they will steal your future. They will steal potential relationships that could have been just wonderful. Words. They mean more than we will ever realize.